Snapchat is one of the most popular social media platforms used by kids these days. With Snapchat, kids can send videos out that disappear after a short period of time, or after the recipient has seen them. Because of this feature, a lot of kids have started using Snapchat for sexting and other shady purposes. That’s why it’s so crucial for parents to learn how to monitor Snapchat. If you monitor Snapchat, you can find out what your kids discuss with their friends, if they’re doing anything inappropriate, or if they’re getting cyberbullied. It gives you the power to really take care of them and protect them from the world. There are a lot of great Snapchat monitoring apps in the market, and there are also several spam apps out there. To help you weed out the spam from the legitimate apps, we’ve created this article. In this article, we’ll show you how to monitor Snapchat using one of the 10 Best Snapchat Monitoring Apps to Monitor Your Kid’s Snapchat. Cocospy is another one of the most reliable and trustworthy Snapchat monitoring apps in the world and it’s trusted by millions of users worldwide. Don’t worry, you can use Cocospy to monitor Snapchat in stealth mode and do not need to root or jailbreak the target phone. Direct Snapchat Monitoring: Cocospy makes the process of spying on Snapchat extremely easy. Simply click on the relevant ‘Social Apps’ tab and you can gain access to all of its Snapchat spying features. You can review all of the photos and videos exchanged over the app, read all text messages, get contact details, and even retrieve deleted pictures. Keylogger: This feature is the same as the one in mSpy. You can access a log of all of the user’s keystrokes. If they’ve recently logged into Snapchat with their password, you’ll be able to decipher the password and then access Snapchat whenever you want. You’ll even be able to hijack the account completely. How to Monitor My Child’s Snapchat? Step 1: Create an account with Cocospy. Step 2: Install Cocospy into the target phone after jailbreaking or rooting it. Step 3: From the dashboard, access either the ‘Keylogger’ feature or the ‘Snapchat’ feature. mSpy is the best Snapchat monitoring apps in the market. It’s not the cheapest app, but it has a wide range of powerful features that make the cost completely worth it. One of the best aspects of mSpy is its reliability and discretion. It’s trusted by millions of users around the world and has an established brand name. Furthermore, after you install mSpy into the target phone, you can hide the mSpy icon so your children don’t find out you’re spying on them. Snapchat Monitoring: mSpy has a direct Snapchat Spy feature in its dashboard. 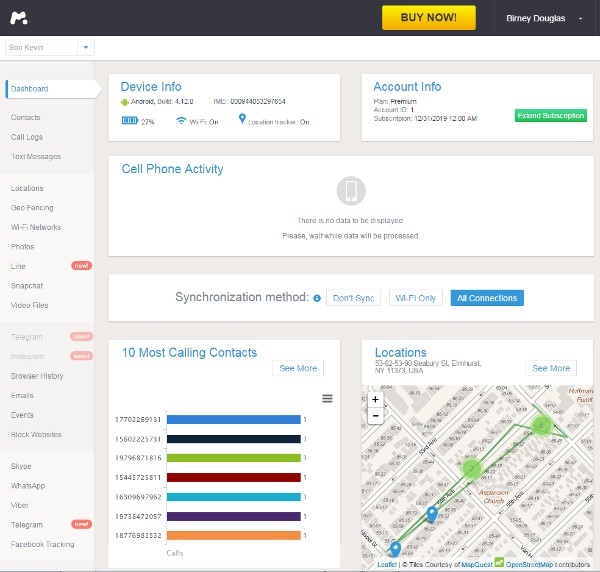 Once you install mSpy into the target phone, you can access all of their Snapchat messages and videos. Snapchat usually deletes the videos within 10 seconds, however, mSpy saves them immediately, thus allowing you to access them whenever you want. In addition to tracking the deleted pictures and videos, you also get a complete date and time stamped message log with contact details. Keylogging: Keylogging is one of the most effective monitoring features out there. With this feature, you get a complete log of all the target user’s keystrokes. As such, whenever they use their password to log into Snapchat, you can find it out. Then you can sign into their account from your own phone without finding out. This feature allows you to completely hijack the account instead of just spying on it. However, deciphering the password is a more complex process than simply checking the message logs. How to Monitor Snapchat on iPhone Without Jailbreak? mSpy has a no-jailbreak solution as well wherein you can simply enter the target user’s iCloud credentials and spy on them without accessing the phone physically. However, the no-jailbreak version doesn’t have the Snapchat Spying or the Keylogging features. In order to access these advanced features, jailbreaking the target iPhone is necessary. Purchase Premium mSpy for your phone because the Basic Version doesn’t have the advanced set of features you need to monitor Snapchat. If you have several kids, you can also get the Family Kit which allows you to monitor up to 3 Snapchat accounts simultaneously. You’ll receive a Welcome email along with a link to your control panel. Once you enter the setup process, you’ll be asked to select whether you want to hack an Android or an iPhone, and whether it should be with jailbreak/rooting or without. Select the correct phone and the jailbreak/rooting version because you can’t monitor Snapchat without jailbreaking. Access the target phone and then install mSpy into it. Go to your own dashboard. Spyzie is the cheapest Snapchat monitoring app in the market. In addition to Snapchat, it’s also perfect for monitoring other social media platforms like Facebook and Instagram. It has a similar range of features as the apps mentioned earlier. And you need to jailbreak or root the target phone in order to spy on Snapchat. However, Spyzie is a lot more secure and discreet than mSpy and Cocospy for one vital reason. In the other apps, you have to manually delete the icon after installing the app. But in Spyzie the icon gets automatically deleted so there’s no possibility of human error due to forgetfulness. Keylogging: You can find out all the keys being pressed by the target phone. As such, the moment your kid logs into Snapchat, you’ll have their password and then you can monitor it from the inside. Snapchat Spy: You can go to the ‘Snapchat’ option in the ‘Social Apps’ tab to get a complete log of all the messages exchanged from the target phone’s Snapchat account. You can also view all the deleted pictures. Go to spyzie.com and create an account. While setting up, you’ll have to enter the target device’s vital information like your kid’s name, their device type, etc. For iPhone – Jailbreak the target iPhone and install the Spyzie iPhone app into it. For Android – Root the target Android phone and install the Spyzie Android app into it. However, before installing, you’ll have to go to Settings > Security, and turn on Unknown Sources. Go to the dashboard and click on the ‘Social Apps’ or the ‘Keylogger’ tabs, depending on the feature you want to use. FlexiSPY is one of the most advanced Snapchat tracking apps in the market. It’s way more advanced than Cocospy or mSpy, with features like Call Interception, Call Recording, etc. However, simply in terms of Snapchat Monitoring, Keylogging and direct Social Media monitoring features are enough. The reason FlexiSPY is lower in this list is because it’s the most expensive app in the market. Even it’s lower subscription model is more expensive than the advanced versions of the other apps. However, if you get the Extreme version of FlexiSPY, you also get a complementary tool called Password Cracker with which you can find out the target user’s Snapchat password directly without having to decipher the keylogging data. hoverwatch is the cheapest Snapchat spy app in the market. However, it’s not very advanced. It doesn’t have a Keylogger feature. As such, if you want to spy on Snapchat, you can only do so directly through the Snapchat spy feature which gives you access to message logs and all deleted videos and snaps. hoverwatch can’t help you find out your kid’s Snapchat password. However, hoverwatch has one great benefit over all the other apps. It can monitor up to 5 Snapchat accounts simultaneously, so it’s ideal for big families. iKeyMonitor is purely meant to be an iPhone parental monitoring app. This app is also discreet and it can be used on Android phones as well. But it works best in iPhones. It has both a direct Snapchat spying feature and a Keylogger feature. With the Keylogger, you can find out all of the target user’s keystrokes and hijack their Snapchat account. iKeyMonitor also comes with a 3-days trial version. XNSPY is a Snapchat monitoring app that’s used by parents to keep track of their kids’s online activities without their knowledge. It’s a perfectly legal and legit application that has been featured in various media channels as well so you can trust it. It’s completely stealthy because you can delete the app’s icon from the target user’s phone after installing it. When it comes to monitoring Snapchat, you can do so directly from the Snapchat Spy feature or you can use the Keylogger feature. Both of them are effective. However, the Keylogger feature will also give you access to the target user’s Snapchat password, allowing you to completely hijack the account if you so choose. Like all the other apps, in order to monitor Snapchat, it’s compulsory for you to jailbreak or root the target phone. FoneMonitor is an Android and iPhone Snapchat Monitoring App. It allows you to track anyone’s online activities from anywhere in the world. You can purchase either the Premium Edition or the Ultimate Edition of the app. However, all Snapchat spying features are only available in the Ultimate package. FoneMonitor isn’t as advanced and powerful as the other apps in this list. If you monitor Snapchat using the direct Snapchat Spy feature, you can only check out the date and time stamped messages. You won’t gain access to all of the deleted pictures and videos. The only way to completely monitor Snapchat using FoneMonitor is to use the keylogger feature to decipher the password and then monitor it from the inside. Guest Spy is a newly established Snapchat monitoring app. As such, it’s not extremely advanced and powerful, however its future seems promising. All you have to do is jailbreak or root the target phone, install the app into it, and then you’ll gain access to the target user’s Snapchat account in your personal control panel! You can use the Keylogger feature to decipher the target user’s Snapchat password by going through a log of all the keys they’ve pressed in their phone. This gives you the chance to log into their Snapchat account secretly and monitor all their activities. Guest Spy also comes with a 5 days money back guarantee. OneSpy is a completely reliable and trustworthy India-based Snapchat Hacking App. One of the things that sets them apart is the fact that their website clearly lists out their physical address. You can make an appointment to physically meet them any time, so you know that they’re not a scam or illegitimate business. Like the other apps, jailbreaking and rooting the phone is necessary if your want to monitor Snapchat. You can do so either through the direct Snapchat Spy feature or via the Keylogger feature. Installing the app into the target phone is a simple 5-minute process and you can delete the OneSpy icon after installation. The biggest issue with this app is that it’s meant only for Android phones, not for iPhones. As you can see, there are a lot of different ways to monitor Snapchat account without your kids finding out. My personal recommendation is to use mSpy or Cocospy for the purpose as they’re the most advanced and well reputed apps in the market. Some of the other Snapchat Monitoring apps also have their unique advantages. For example, FlexiSPY gives you access to a direct Password Cracker, even though it’s very expensive. And hoverwatch allows you to monitor up to 5 Snapchat accounts simultaneously, even though it’s not very advanced. The final decision regarding which app to use is all yours. However, whatever you decide, do let us know about it down in the comments section. We’d love to hear your opinions! How Can I Monitor My Child’s Text Messages Without Them Knowing for Free?